Please join the Veteran Employee Resource Group for the 2nd in our lecture series on Health Issues facing Veterans. Our panel of esteemed speakers include Dr. Jessica Stern, Clinical Psychologist and Jonathan Kessler, Supervisor and Team Leader for NY Harbor VA’s HUD/VASH Housing First ACT Team. 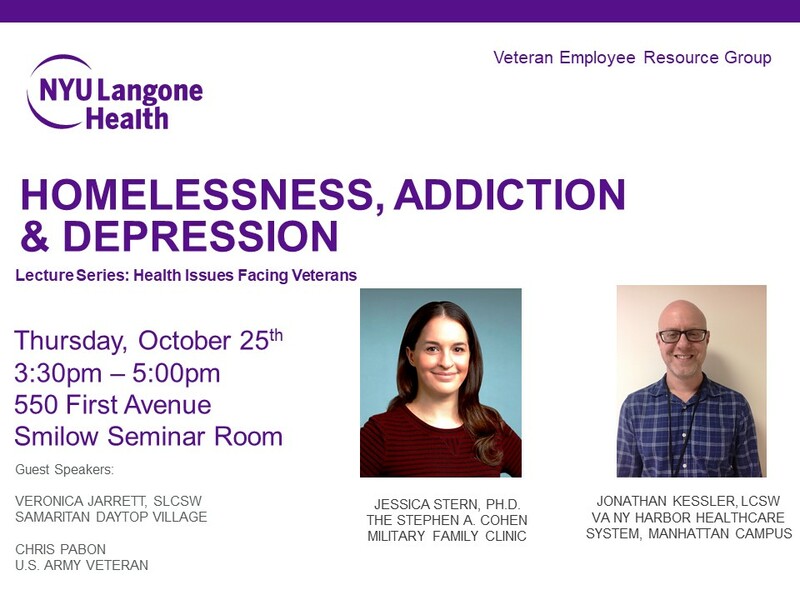 Special guests include Chris Pabon, U.S. Army veteran who will share his own story of addiction and mental health issues on his road to recovery right here in New York City and Veronica Jarrett, SLCSW from Samaritan Daytop Village.